»Arabic»Madinah Book 1-Class 9 Notes by Ustaadhah Sameerah Al Harbi. We learn in class 4th that how to change نكرة to معرفة. We said there are two ways to do so. First way we learnt in class 4th and now we will take second way which is called الإضافة(construction/adding a word to another word/a kind of possession but not possession all the time). In sentence on book , ”أكتاب محمدٍ” and ”كتاب حامدٍ” both are same, only difference is that in أكتاب there are two words. 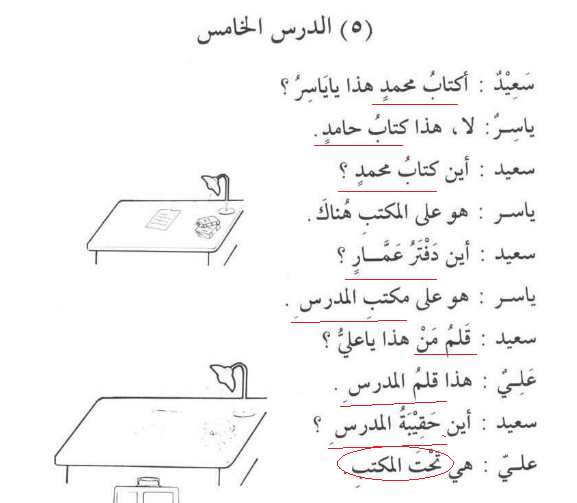 First, one is حرف همزة الإستفهام which is used to ask ,”yes ” and ”No” questions. What is common between these examples underlined? We learnt that the sign of a word being نكرة is Tanween and the sign for معرفة is ال التعريف. In the underlined words the first words like the first word–> كتابُ is not having tanween neither it have ال التعريف. Then, what kind of word is this? This is actually معرفة this is why it don’t have tanween. How can we know this is معرفة because we don’t see ال التعريف in beginning ?Because, this word is actually being ADDED to Another word. Just like possession. In this sentence ”the added word is ”حامدٍ ”. Hence, the underlined words —> كتاب حامدٍ meaning ”Haamid’s book”. In this you specified the ”Kitaab” by adding it to ”Haamid”. Hence, this book belongs to Haamid. Here, Haamid is the possessor and the book is the thing possessed. The word we want to make معرفة is the first word which is the thing being possessed. In Arabic we say it, ”المُضَاف”.In this example above , ”Kitaabu” is المُضَاف. Whichever word comes following the المُضَاف is called المُضَافُ إليه . In this sentence is حامدٍ . When the word , ” كتابُ” came before , ”حامدٍ”. Kitaab word loses its tanween and changes to معرفة because now we know this book belongs to Haamid. This construction is called الإضافة .Literally it means , ”Addition” because you add one word to another so that it becomes معرفة. The way to know if the word is المُضَافُ إليه is that before it, the word will have one harakah. 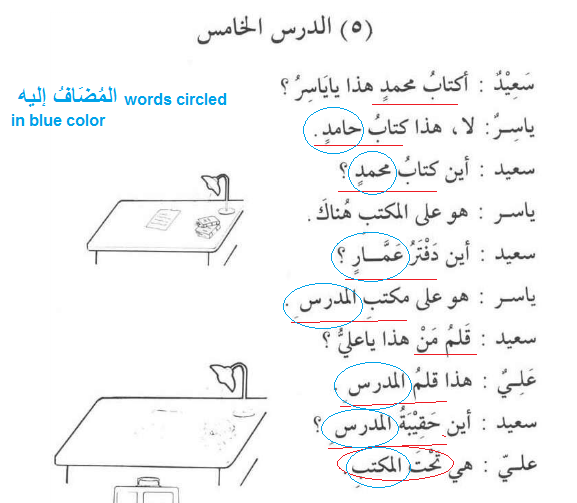 All circled المُضَافُ إليه have Kasrah ending be it Tanweenu Kasr or Just Kasrah. We notice in sentence هو على مكنبِ المدرسِ and sentence ِهي تحتَ المكتب. The ending of المُضَاف is varying . So, it can be Fathah, Dhammadh or Kasrah. Why is that ? Because,المُضَاف comes in different grammatical positions. But, المُضَافُ إليه always ends in KASRAH. ← Madinah Book 1-Class 8 Notes by Ustaadhah Sameerah Al Harbi.